It’s difficult to beat the perfect summer night in Colorado. It usually involves friends around the table, eating good food and conversing over the state’s finest suds. But let’s be honest, there’s always a way to make something even better. To raise the bar on your summer evenings, all it takes is some gumption, determination and a heck of a lot of instruction. The Sentinel is here to help you figure out how to build a perfect summer night’s dinner — from the food, to the drinks — even the table. Part one: Every great meal needs a great base. Literally. Stories behind a piece of furniture are usually pretty dull. “I bought it online,” “I found it at a thrift store,” “It came with the place,” “We found it in the alley.” But when it comes to making a perfect summer meal, what better way to start than with the perfect table. And if you want something done right, you need to craft it yourself. Hutchinson said that much like life, no project ever goes as planned. But the beauty and satisfaction of woodworking comes from the process and determination of working on the project and sticking with it. Hutchinson said that people who want to build their own table, chair or anything else of wood, should listen to that desire. But just because someone has the drive to make something out of wood, that doesn’t mean they should go running off to the hardware store to buy a table saw. Power tools are a dangerous business. No matter how strong the desire is to learn, it’s important to get training on how to work with wood. There are multiple outlets to learn how, from classes at Red Rocks Community College to private instructors. 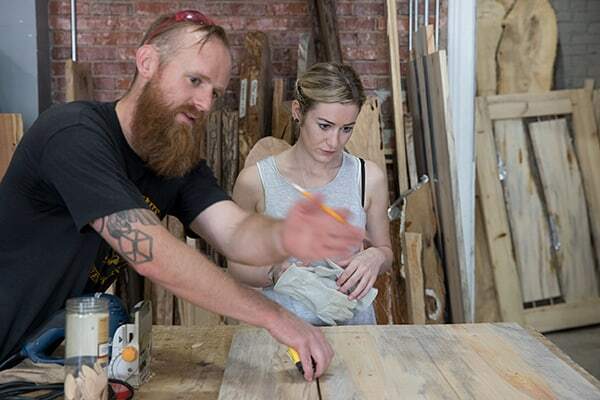 One option is to work with Francis Eggelton, one of the owners of I Made it Workshop, a community woodworking shop in Denver that walks people from the inception to the completion of their dream project. Marci Perry first came to Eggelton’s shop several months ago to make a sign for her shoeshine business, Denver Shine Company. She had no experience and wasn’t sure what to expect, but after completing the first project, she kept returning to build more things for her business. Eggelton said I Made It’s instructors take the ideas customers walk in with and help sketch out the ideas, start the process and then teach them how to bring their vision to life. And for a basic table to host the perfect summer dinner on? Eggelton said it might take between 12 to 16 hours of work and about $400 to 500, much less than what a handcrafted table might cost at a store. Book your own class now and experience woodworking.